This is a really exquisite dress dating from about 1815. It is of pale coffee silk with cream trim. The high waist is in the style of the day, it has long sleeves and back fastening. The skirt falls from the high waist and is generously gathered at the back. The hem, sleeves and shoulders are trimmed with delightful padded "cushions". The bodice is lined in beige cotton/linen. The highlight of this lovely dress is the fine hand.pleating on the back bodice.Narrow hand worked pleats which must have taken hours of difficult sewing. In addition to this, there are the original tiny buttons and buttonholes, all beautifully worked. Delightful! This lovely dress is in very good condition. There is very slight fading to part of the skirt and one sleeve,but this is only visible in certain lights. The silk reflects, so the fading is not a great problem. There is one very small hole at the back waist. The under-arms are good. Just a little creased from wear, but no shattering of the silk or bad marks. 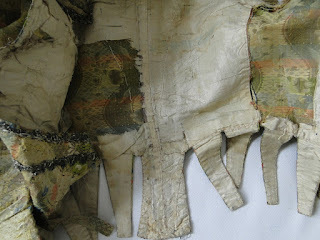 The bodice lining is slightly marksed from wear, but in keeping with the age, and having been worn. I cannot detect any obvious alterations. All in all a beautiful dress and very much "of the era". Strong silk and no weaknesses that I can detect. Measurements: Length from shoulder to hem 56". High waist approx. 28". Across shoulders 13"
I think this dress was reworked several times. There are elements of a couple of different decades. The back pleating is very 1790's. 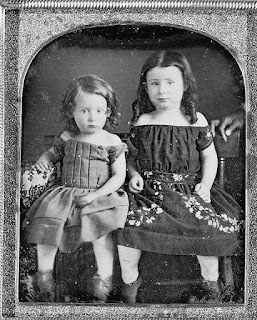 The extreme high waistline is 1800's. However, the roped hem and the puffy decorations on the dress are more in keeping with the late 1810's/early 1820's. There is one from about 1819 in the Met with similar decorations and looks to have a corded hem. I'm putting this in the 1810's but know it could have easily been worn in the early 1820's as well. This little girl's summer dress is beautifully hand worked in a fabric typical of the period. It has a cream background with a tiny design in dark pink. The dress has the usual wide neckline, little trimmed cap sleeves, a drawstring at the waist and neck. All the drawstrings are present, which is quite unusual. The bodice is beautifully made with box pleats from waist to neckline. The skirt is very full, and draws up very prettily. The condition is excellent, with just one timy mark on the back skirt. Otherwise crisp and fresh. This could easily be either a little boy's or a little girl's dress. There really isn't anything to indicate gender. I believe this is from the 1840's based on similar necklines and bodice treatments existing in adult clothing at that time period. The seller indicates they believe it to be from between 1825-1830 in the auction's title. Below is a photo of a child wearing a very similar dress. A simple but charming girl's brown glazed cotton bonnet dating to about 1810. The bonnet is nicely constructed and all hand stitched with a drawstring into the back neck, and ties. This bonnet is in good condition with just a few pin holes in the back, only visible when held to the light. The bonnet measures approximately 7" from crown to brim. The one in the bottom left corner of the above 1801 fashion plate looks the most similar to the extant one. 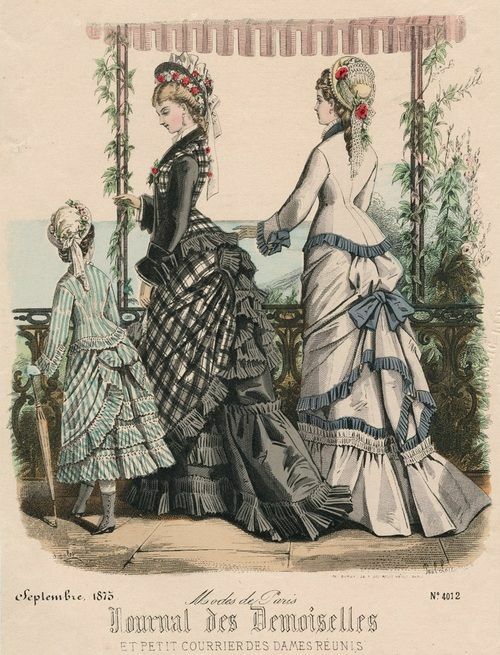 However, this style was popular off and on for a while in the early 19th century so it could be much later. 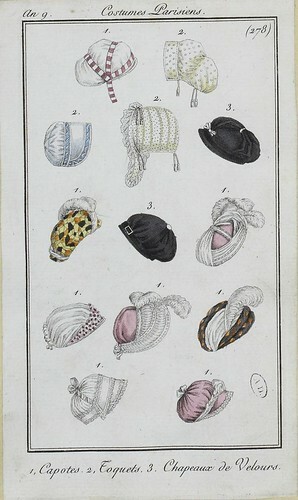 English fashion plates from 1801, and French fashion plates from Year 9 (1800-1801) of the French Republican Calendar. All images come from the collection of the Bibliothèque des Arts Décoratifs. A very pretty Victorian silk dress made up of 18th century floral gown silk. 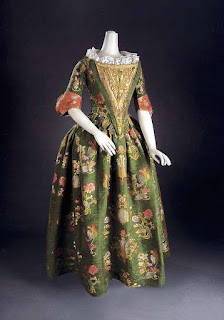 It dates to about 1845, the silk to about 1770. This dress has been very well made, and is lined throughout with fine beige cotton - all hand worked of course. There is not much wrong with the dress, except the "piecing" of the top of the front bodice. I think this was done to save material, but also I assume there would have been a lace or silk frill covering this. The sleeves are pretty with an unusual trim. The silk is of a good quality - robust and crisp. The hooks at the back could be slightly later, and there is also slight marking to the under-arms. Nothing too bad, as on display this does not show. There is a great deal of lovely 18th century silk in this dress, and the skirt panels are of an 18th century width. Therefore, if one wanted to dismantle this dress, and use the fabric, there is plenty there. 18th century dress silk is very expensive, if one buying simply a sample length of it! In this dress, there are several lengths from waist to hem. Measurements: Length shoulder to hem 53". Approximate waist 23". Bust 31"
Very much 18th C fabric but the cut of this dress is all 1840's. 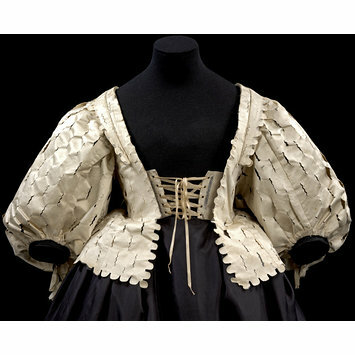 Circa 18THC a early brocade bodice with metallic trim.In mainly strong condiiton, but there is age related wear and openings,one 2” tear under arm..,one split on sleeve.. other sleeve has a few splits..a couple of small splits near armhole,minor.one small partial seam and opening at the top on the back which can be undone .Inner lining has loss..perhaps best to remove if desired.Part of a museum deaccession. I've been staring at this for days and I still have no clue when it's from. The trim lines in the back and the clear stitching that indicates on the inside that this once had stays in it makes me think it's more 17th C than 18th C.
See the tabs? The trim lines in the back? 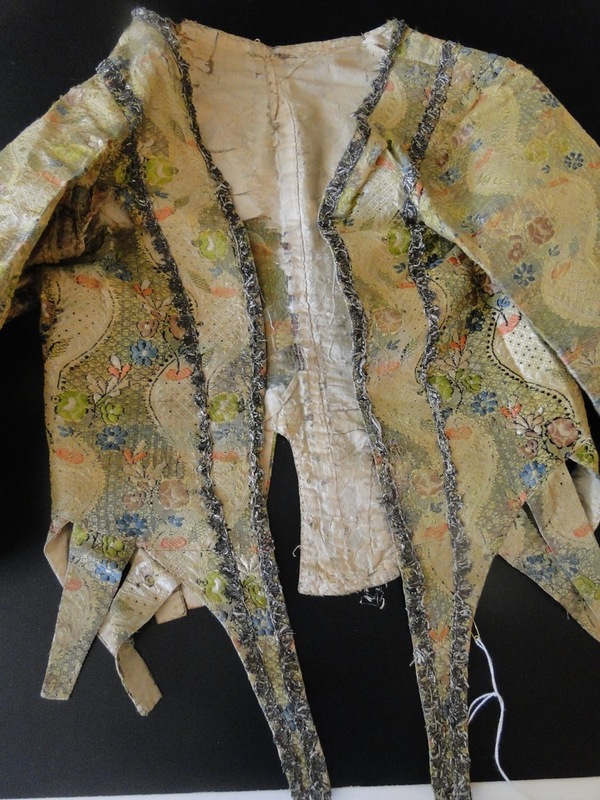 We never get a good picture of the sleeves on this extant one so it's hard to tell what's going on there but with the supported back and trim line, it looks 17th century. ...And then there is the front. And the fabric. 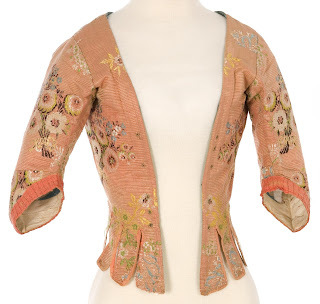 The fabric, given the style and the colors, could be early 18th century - the entire jacket is no later than the 1740's at any rate. There is a similar fabric piece up at the V & A from the 1710's. Very similar colorways and design. So maybe 1710's? So...I have no idea. It doesn't help that the imatex database does have a few similar jackets but lists them as the very unhelpful "18th Century". At least if they gave "first quarter" or something similar, it would be helpful. (If anyone would like to see those jackets, just click the Imatex database link above and search for "Gipó".) However, even with those, the front is different. One of the generic "18th Century" jackets from the Imatex database. The biggest difference is in the front tabs. In the extant one I can't figure out the date for, it has two very long, very thin tabs that are curved in to be wider at the top and narrower at the bottom. All the tabs are quite thin - more in keeping with the early 18th century and...late 17th century. Although, there were some thin tabs in some regions in the very late 18th century as well. So, again, not sure when the jacket actually belongs too. For now, I'm putting it in the 1710's but it could be considerably earlier or later. Overall Length: (Peplum) Front: 23" Back: 24 1/2"
The outfit is missing the overskirt - if this even went together which I'm not entirely sure it did. In the fashion plate above, the white-ish and blue trimmed dress has a very similar bodice to the extant one.